Prototypes of the Nikola One will hit the roadways next year and full production of the vehicle is scheduled for 2022. The year 2018 has been a big one for Nikola Corporation, and investors continue to line up to support the hydrogen-electric truck startup. Next year might be even bigger. On Wednesday, Nikola Corporation announced it had completed an oversubscribed Series C funding round that began in August. Wednesday’s announcement was of $105 million, bringing the two-stage round to $205 million total. CEO and founder Trevor Milton said the goal was to raise $150 million. Investors have not been identified. Ground should be broken for the factory next year, Milton said. Both the North American models, the hydrogen-electric powered Nikola One and Nikola Two (day cab), will be produced at the Arizona manufacturing plant once they enter full production. The company is spending more than $1 billion over the next six years to develop the facility on the west side of Phoenix. As good as 2018 has been, 2019 looks to be even better for Nikola. The $1B funding round should kick the company’s work into high gear, and drivers should start to see the trucks on the road. Anheuser-Busch, which ordered up to 800 of the trucks earlier this year, will be among the companies that will likely have trucks in their fleet by next year. Milton said original prototypes will hit the roads next year for validation and some of the larger orders will be going out in the 2020-2021 timeframe. Full production is slated to begin in 2022. Last week, Nikola introduced its Nikola Tre European model. The Tre will receive its official introduction April 16-17 at Nikola World, a large event the company is planning in Phoenix. The Tre will be shown alongside the Nikola One and Nikola Two (day cab) vehicles at the event. The Nikola Tre was announced earlier this week. The truck, using the same hydrogen-electric platform as the U.S. models, will be sold in Europe and Australia. 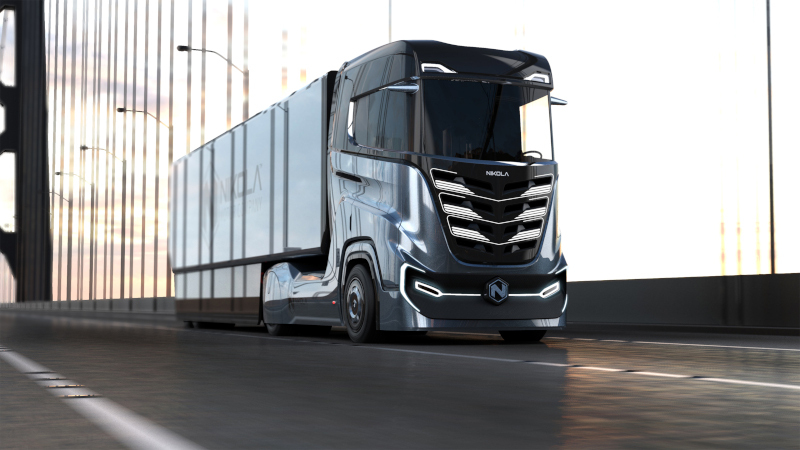 The cost per mile for the Nikola Tre is expected to be 10-20% less than comparable diesels in Europe, the company said. Since the announcement, Nikola said it has logged over $380 million in orders for the Nikola Tre. Pre-orders for the U.S. models have topped $8B, Nikola has previously said. Nikola is looking to identify a European location for a manufacturing facility. By 2028, Nikola is planning on having hydrogen coverage in the U.S., Canada, Europe and Australia. That process of starting to build the network will begin in 2020, Milton said. The Anheuser-Busch contract calls for 28 hydrogen fuel stations throughout the country. Initial locations will be announced later this year, and the first trucks will be prototype versions. The stations are expected to be open to the public. Ryder will provide all sales and service warranty coverage in the transaction, Milton said. Anheuser-Busch’s dedicated fleet is between 750 and 900 trucks, the company said, and hauls about one-third of the company’s total shipments. The Nikola order could potentially replace the entire dedicated fleet by 2025, however, Anheuser-Busch said it does have current commitments for other alternative fuel vehicles. The trucks delivered to Anheuser-Busch will be the Nikola Two, which is the day cab version. It will have a range of between 500 and 1,200 miles, produce zero emissions, and can be refueled in 20 minutes.